One of the highlights of the recent Sea Coast Toast fundraiser for the Gumbo Limbo Nature Center was the presentation of the first CRESTT award to Dr. Jeanette Wyneken (See photos), a professor in the Department of Biological Sciences at Florida Atlantic University. The award was given by the Sea Coast Toast Committee, representing the Friends of the Gumbo Limbo Nature Center, to honor and recognize a professional outside of their organization who shares their passion for and dedication to Conservation, Research, Education, and Stewardship for Today and Tomorrow. The Committee not only brought their own list of candidates to the table, but also asked key staff at the Center for input. Dr. Wyneken was the overwhelming choice for the award by both the Committee and center Staff. In her acceptance speech, Dr. Wyneken emphasized the many years of cooperative association between the Staff running the Sea Turtle Program at the Nature Center, and the faculty and students in Biology at Florida Atlantic University. A number of graduate students in FAU's Biology Department completed degrees based upon research done either at the Boca Raton nesting beach, or in the indoor or outdoor tanks on the grounds of the Nature Center. Several students have also had fruitful collaborations with Dr. Kirt Rusenko, who manages and directs the Nature Center's the sea turtle program. Some have been members of his staff before, during or after completing degrees at FAU. The association has been close and fruitful! 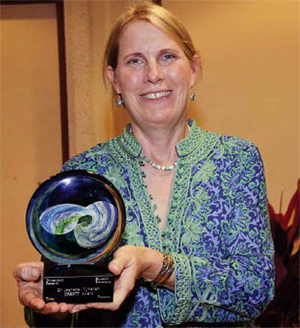 Dr. Wyneken has been working on many aspects of marine turtle biology since she began her studies in the late 1970's. Her interests range from behavioral aspects (orientation and migration) to turtle anatomy and physiology. She pioneered in the development of laparoscopic techniques for early (and most importantly, non-lethal) sexing of marine turtles, and (with her colleague Dr. Kate Mansfield) in the development of miniature satellite tags for tracking the movements of juvenile turtles. Thanks to this innovation, we are learning for the first time where small turtles go after they leave Florida's beaches. Wyneken has served as a co-editor for the last two volumes of “The Biology of Sea Turtles”, and has published a definitive treatise on “The Anatomy of Sea Turtles” that has been reprinted and translated into several languages (most recently, Chinese!). About a dozen Masters students have completed degrees under her direction. Her first doctoral student will be finishing his degree in the Spring. Dr. Wyneken is also a much sought-after public speaker on issues related to marine turtle biology, conservation and management. Her studies have been supported by several outside agencies, among them the Save our Seas Foundation and most recently by the National Save The Sea Turtle Foundation. Jeanette holds the CRESTT award.